Iran's vice president acknowledged on Tuesday that U.S. sanctions would hurt the economy, but promised to "sell as much oil as we can" and protect banking. Eshaq Jahangiri said Washington was trying to stop Iran's petrochemical, steel and copper exports. "America seeks to reduce Iran's oil sales, our vital source of income, to zero," he said, according to Fars news agency. "It would be a mistake to think the U.S. economic war against Iran will have no impact," Jahangiri added. President Donald Trump said in May he would pull the United States out of an international accord under which Tehran had agreed to limit its nuclear development in exchange for sanctions relief. Trump said he would reintroduce sanctions and Washington later told countries they must stop buying Iran’s oil from Nov. 4 or face financial consequences. On Tuesday, the U.S. ambassador to Germany also called on Berlin to block an Iranian bid to withdraw large sums of cash from bank accounts in Germany. 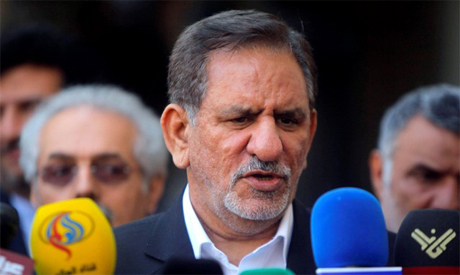 Jahangiri said Iran’s foreign ministry and the central bank have taken measures to facilitate Iran’s banking operations despite the U.S. sanctions. He did not elaborate. European powers, which still support the nuclear deal, say they will do more to encourage their businesses to remain engaged with Iran - though a number of firms have already said they plan to pull out. He added that the U.S. pressure on Iran came as the United States launched an "economic war with China and even its allies", referring to trade tensions between Washington and many of its main trading partners. He also accused Washington of trying to use the economic pressure to provoke street protests in Iran.